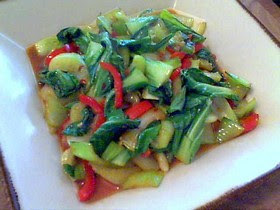 Recipes Cooking: Garlic Ginger Bok Choy – Cheap Easy and Fun to Say! Garlic Ginger Bok Choy – Cheap Easy and Fun to Say! Bok Choy is becoming very easy to find in grocery stores these days as the trend to eat green veggies continues to grow (for good reason). This is great vegetable for many reasons; it’s cheap, it takes about 3 minutes to cook, it has a beautiful subtle sweet flavor, and of course it’s packed with nutritional goodness. As you’ll see, the best tip for great Bok Choy is how to trim the tops and bottoms separately so they both can cook perfectly. One quick anecdote before you watch the clip. I was taking roll call on Day 1 in one of my first classes as an instructor at the Culinary Academy, and was going down the list calling out the names and listening for the traditional call back, “here Chef,” when I saw on my roster “Bok Choy.” Well, that’s an interesting name, so I called out the name and heard in a very deep voice, “here Chef.” I looked up to make eye contact, as I did with all the students as I called roll for the first time, and sitting there was this very tall, Scandinavian-looking gentleman with blond curly hair. I asked him if that was his nickname and he said no, that was his real name. Now, the classes at the school were 3 weeks long, and as much as I wanted to, I resisted the temptation to go up and ask this man how he came to get the name Bok Choy. So, Bok Choy, if you are reading this post, please email or comment and tell me how you got the name! It’s been 5 years and I’m still wondering.